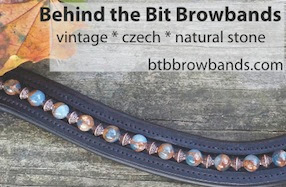 It takes a while to get to the meat of the matter, here -- the browband -- but if the effect is truly what you see in this video, are these browbands AWESOME??? Oh my - pony bling with option to match your pony. I wish I read German - doesn't appear that they ship to the US or have dealers here (yet). They are beautiful. I'm guessing you can get matching bracelet and dog collar? Sort of an all round glitz fashion statement? Love the colors. I wish my house and barn looked like that! Seriously! That horse is beautiful. WANT! The tack is pretty too. Love the horse. Did you notice the bling on the breast plate too? I guess I'm a traditionalist, and I love good high quality leather. Hey guys... I'm glaud you like our tack ;-) If you use google chrome, our webside will be translated automatically. the English version is going to be available soon. Check on our second video and you will see what it is about.